When Harley announced the death of the Dyna exactly one month ago, there were howls of anguish. 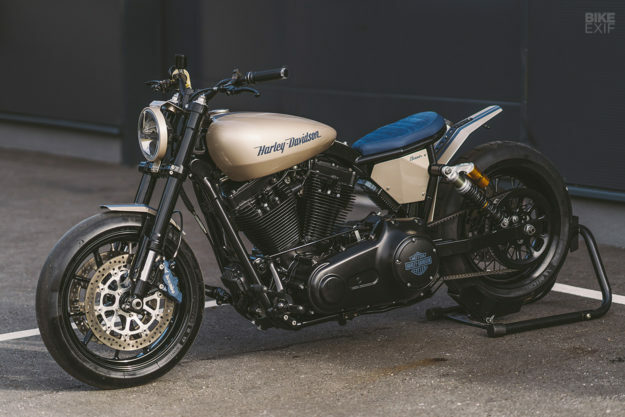 But we’re hoping that folks who want the latest and greatest will just move their bikes onto the secondhand market, because the Dyna is a terrific platform for customizing. We’ve seen some killer builds over the years—stand up Winston Yeh of Rough Crafts in particular—and NCT have just boosted the roster. 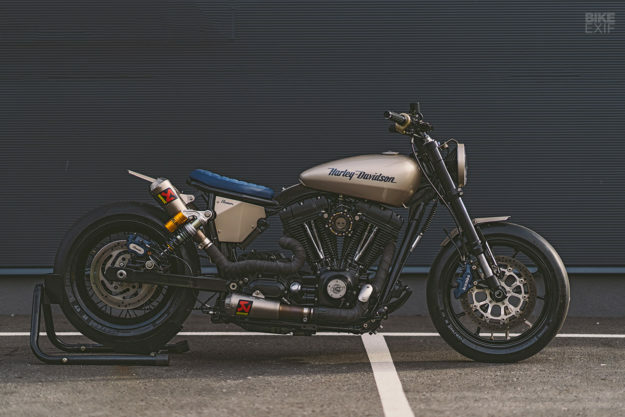 Meet ‘Eleanor,’ a menacing, low-slung FXD with a drag bike vibe and suspension upgrades to match. 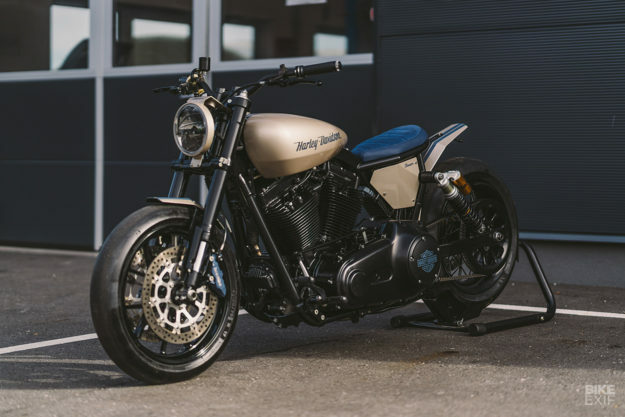 Eleanor is a 2009 FXD Dyna Super Glide, and she was shipped from California to NCT’s workshop in Feldkirchen, Austria—high up in the eastern Alps. But this is no cosmetic job: the Dyna was stripped right down to pieces, with the engine removed and heavy modifications to the back of the frame by fabricator Manuel Tilke. 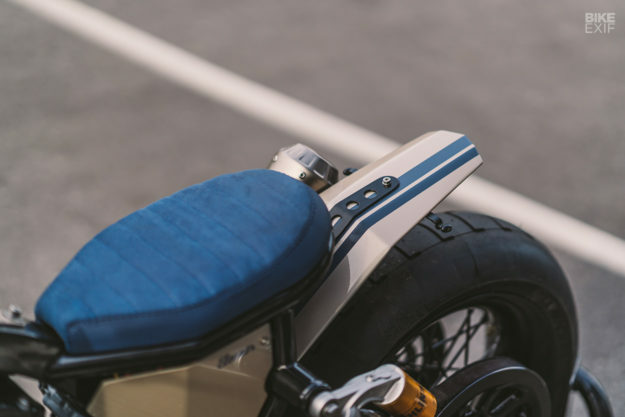 The subframe is now just enough to support a neat blue leather solo seat: nothing more, nothing less. The leather is dyed to the same blue used for the tank logo and striping, and the brake calipers. The front caliper is Brembo; the rear two-piston gripper is branded with an ‘Eleanor’ logo. 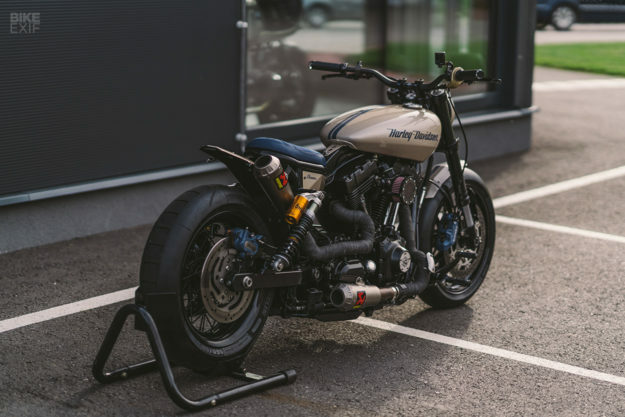 The tank is from the striking Harley Street custom that we featured a couple of months ago, and was a surprisingly easy fit: “We just had to renew the mounting points,” David reveals. The suspension required more work. The stock 49mm aluminum forks are gone, replaced by higher-spec Showa USD items. And the standard real coilover shocks have been upgraded to Öhlins piggybacks. 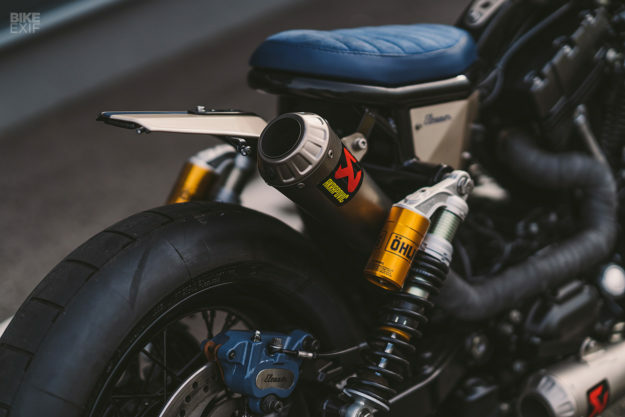 Sneaking between the classic Dyna twin shock setup is the Akrapovič muffler for the rear cylinder, exiting to the right of the vestigial rear fender. 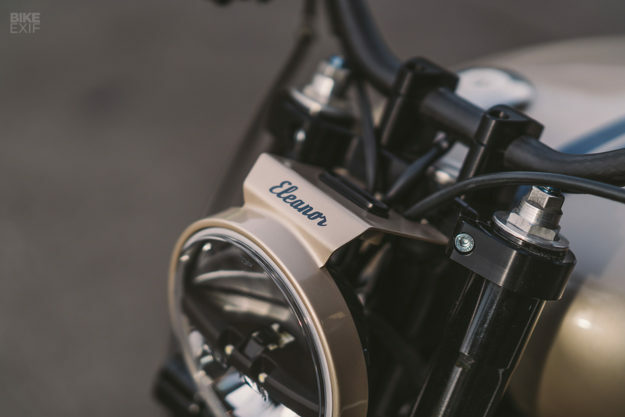 The equally stubby front cylinder outlet sits low down, just above the bottom frame rails. The engine has been thoroughly overhauled, but the internals are stock. With 96 cu. in. (1584 cc) of capacity, there’s no shortage of stump-pulling torque. It’s probably enough to spin up the back wheel, if you’re clumsy with the clutch. But the sticky rubber will resist: It’s Michelin’s radical new Power Super Moto compound—in 120/70 R 17 at the front, and 160/60 R 17 at the back. The heart of the new electrical system is a Motogadget m.unit control box, which NCT fit to all their custom builds. Motogadget also supplied the speedo that is flush-fitted into the headlight mounting bracket, the front turn signals, and the tiny push-button m.switch units—which are sitting on lightweight carbon LSL bars. The master cylinders and reservoirs are from Galespeed and Rizoma. 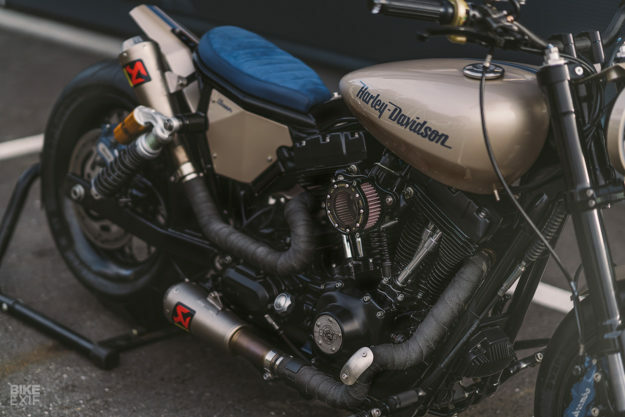 Like most of the best paint jobs we see, this one is simple but expertly applied: bronze on the tank and the new fenders and side panels, and black for the frame and hard parts. 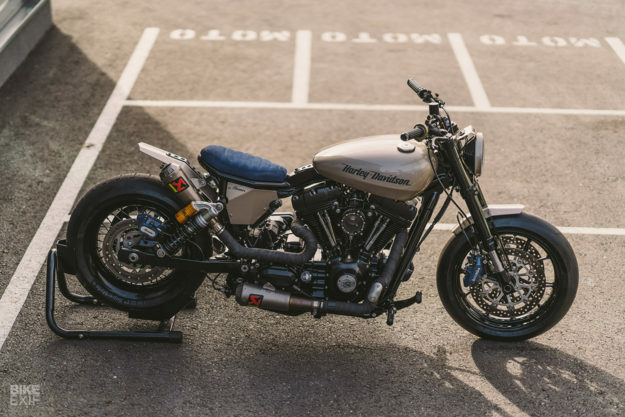 Eleanor is a showpiece build for NCT’s top-level skills, and was one of the headliners at the European Bike Week a couple of weeks ago. But she’s no trailer queen: she’s now David’s daily rider. “She’s a totally comfortable and powerful bike,” he says. We have to admit to a twinge of jealousy there. But anything that keeps the Dyna in the public eye has to be good news, ja?